I didn't show it in my Networth post yesterday - but Jordan and I have more good news on our overall net worth. Last year we connected with a real estate agent and found that on the market our home was worth $377,000 - we connected again this past month and found that on the market our house would be listed at $390,000! Our tax assessment came in as well, and it went up from $328,600 to $363,200 - which validates the increase in market I think (if it had gone down or was the same, I wouldn't be as confident in the real estate agent's opinion). 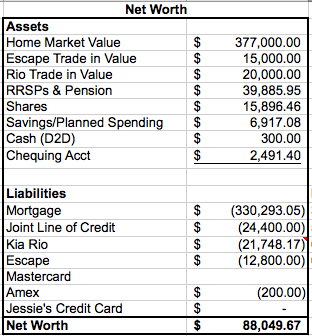 Our net worth shot up from $77,804 to $88,068 in the last month! A big piece of that came from my educational reimbursement ($1,900) and Jordan's dental reimbursement ($2,700). Of course it also went up because of our regular debt repayments and regular savings as well as the increase in value of our investments (share, pension, rrsp). There is a small balance on our Amex that we'll pay off next week, our Escape is down to $12,800 and the LOC is down to $24,400 - combined there's $37, 200 - which I could combine onto the LOC which has a lower interest rate. I'm really torn - because the interest is 1.41% lower - but the LOC is tied to prime which could go up at anytime. 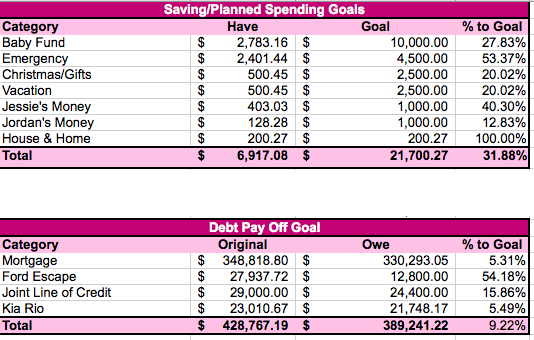 I update my tracking bars more regularly then I post these but I thought I would share where we're at with our planning spending goals - I suppose the emergency and baby fund aren't exactly planned spending - but they aren't us unaccessible as the RRSPs/Pension/Shares (which I'm not showing here). We're coming along on paying off our debt - here's a snapshot of where we are at.